This is such an outstanding semester - the students are talented and enthusiastic. 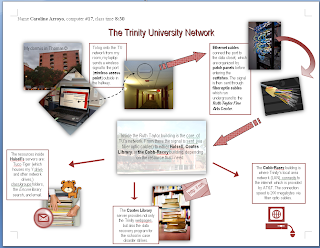 Here's an example of a very comprehensive diagram of the compicated Trinity University local area network drawn using only the fairly limited tools provided by MS Word - great job, Caroline - and everyone else. You all have proven that there is more than one "right answer" to a design assignment.